Lek was waiting in Craig’s study. She had been building up the courage for this moment for days and at the precise moment that she had chosen to do it, he had gone to the toilet. She knew that if he didn’t get back soon, she would be in tears before she could tell him her news. She heard the flush go, so she steeled herself, but then the shower started. He would have to pick just this moment to have a shower too, she thought, but to be fair, he didn’t know that she wanted to speak to him. They spoke so seldom to each other these days. Lek started to dust his desk with her handkerchief and tidy his bits and pieces for something to distract her, but she could feel the tears welling up in her eyes already. What the Hell was he doing in there? She went into the kitchen and poured Craig his second daily cup of coffee, took it back into the office, cleared a space for it among the clutter on his desk and carefully and put it down. Clack! The bolt was thrown on the bathroom door with the sound of a rifle being cocked. As he came into the office moments later, he was surprised to see Lek standing there – she would normally have left the house hours ago to embark on her quotidian routine tour of friends for coffee and then lunch. That was it, she was crying. Tears flowed down her face although unaccompanied by any sounds of sobbing at all. Once she had spoken, Lek regained her composure and the tears ceased to flow, but as the magnitude of what Lek has just said sank in, Craig began to cry. It had been so unexpected. He had seen no signs. Not a dicky bird. He looked up at Lek, who was calmly staring back into his watery eyes. “I don’t know where to start, Craig, but I have been unhappy for some time. I expected more than this. I thought… I spent ten years waiting for my hero to rescue me and all the time I worked and put up with crap, but worked on and dreamed of a better life. Then I met you and thought that my dreams had come true… I am not saying this well. It is not your fault, but I expected more and I want more than…. this. “We have been together for about eight years and married for five or six years, but I am poorer now than when I was working. I know that it is not your fault, Craig, you work hard, but… well, you know, we have nothing and I don’t want to live like that. “Soom has been at university for a year now and it costs… I want my daughter to go to university and I cannot see how we can afford it on the money you earn. I tried to better myself too; I went back to school, but there is no work for people like me here in Baan Suay. If we had a car, maybe I could get a job somewhere near, but… not have. “What? Us falling in love was a ‘big accident’? My coming over here, building a house that I will never own and working fifteen hours a day for eight years is just a ‘big accident’? “OK, lovely accident, but now my daughter must have money and I don’t have. You have?… No? So I must go get. Or can you go get? If you cannot, I must. My mother cannot give; my family cannot give. You think that Soom must work on weekends and at night? She cannot make enough money in a hamburger bar to pay for university, so what you want her to do? Work in a bar same me before? Now they were both crying and Craig stood up to hug his wife, his mind racing with possibilities to save their marriage. After a few moments, Lek pulled away, “I am sorry, Craig, but it is no good getting close and crying. Something has to be done and if I am going to go away, this is not helping either of us. You understand why I must do this and I understand that you cannot help me. “I do not lie to you, my husband, but it is true that I do not, or have not always told you the truth one hundred percent. I tried to many times, maybe every time in the beginning, but the language was between us and … well, it was easier not to. “When I worked in Daddy’s Hobby, I did lots of things that I did not want to do because I had to do them. I do not want to say any more about that unless you ask me and that is your right, I think. “Anyway, I saved some money for Soom’s education. Goong also left me 500,000 Baht when she died four or five years ago. I gave some of it to her family, but kept most of it. “I don’t have much of it left now. I was bored here for years with nothing to do and gambled a lot of it away on cards. I paid Soom’s university fees last year and I have supplemented the money that you gave me for food for several years. “Now, I cannot pay Soom’s university fees when they come up next year and cannot buy her the clothes, books and laptop that she needs right now to be comfortable with her studies. I don’t want her to look poor in university! She is the first person in my family to go to university and I want to give her every chance. A few tears escaped her eyes, but she quickly wiped them away with her hand. Craig was looking down at the beautifully-tiled floor, feeling like a total failure. Lek was glad of the excuse to get out and be alone and, having recovered somewhat from the initial shock, so was Craig. After Lek had left, he finished his cold coffee in one, packed up his laptop and went to the shop where he did a lot of his thinking. The office was for slog work, but Nong’s shop was for deep cogitation, usually over a few ice-cold beers. Watching the people in the village coming and going, carrying out their daily lives had always had a calming, yet inspirational effect upon him. He sat down at the one table outside the shop and waited for Nong to notice him. He had been drinking at Nong’s shop for eight years, but they still could not talk to each other in any meaningful way. Nong appeared not to have an aptitude for English and Craig had spent most of his time trying to earn money rather than learn Thai. As he was staring out before himself, he heard Nong say, “Hello Mr. Craig, how are you today?” in Thai. Nong always said that, but then the beer was always cold too. Craig slouched in the bench seat and stretched his feet out in front of himself. He thought with a smile, that if he smoked, this would be a two-pipe problem, as Sherlock Holmes would have said. “Why hadn’t she mentioned it before? Why the sudden crisis? The real bottom line was, if she believed in karma, as she insisted she did, why did she think that she could change her daughter’s karma?” It did not make sense now, although Lek’s news had hit him like a bullet. The problem was that Lek seemed to be sure that her only way forward was to go back to work in a bar. So, whether she was right or wrong in her religious philosophy, she would probably leave him in fourteen days. Craig knew that Lek had an iron will. If that was what she had said she would do, that was what she would do, unless there was a very good reason not to. And the only reason that was good enough was money, so he needed a supply of money. Or he needed to shed the chains that held him and Lek together – he needed to stop loving her. Lek had already decided that she would choose money, although not for entirely selfish reasons. Selfishness was in there though, he was sure. He knew that she would not be able to bear the shame of having to withdraw Soom from university for lack of funds. Although that was the mechanics of the situation, it did not help his predicament. He loved Lek, but he was being offered an honourable way out. No-one would blame him for cutting and running now. Lek had told him that he was on his own. Craig wondered for a little while whether Lek was offering him this easy exit because she had found someone new, but he dismissed the idea as much for lack of evidence as the fact that it would have hurt him too much to countenance it. He believed that Lek was genuinely concerned about her daughter’s future and that helped him with the next choice, which was whether he should stay or go. That would take another beer. It was not that he didn’t want to stay. It was more a question of whether this problem would erupt again over an unrelated issue like Soom’s first home, Soom’s first car, Soom’s babies, when she had them, which she inevitably would. Soom had been brought up by her grandmother as had Lek and he knew that Lek was looking forward to the role in her turn. Craig, however, was not, yet the likelihood of it coming to pass was only three or four years away. Nong saw the empty bottle and swiftly brought another one. The ultimate decision was between selling everything that he had left in the UK, looking after Soom’s children and staying with Lek in the village that he had come to call home or to call it a day and move on. Lek had gone to her Mum’s house, which was just over the lane from their place, less than half-way to Nong’s shop. She hadn’t discussed her predicament with anyone yet, because so much depended on Craig, but she was ready to bite the bullet and go back to work if things worked out that way. She was prepared to accept her own bad fate, but she was not prepared to allow fate to affect Soom’s future, if she could do anything about it. If Craig fell by the wayside, then so be it. The ball was in his court now. She had given him an out and a two-week period to come up with a solution. There was nothing more to do than steel herself again and wait for what her karma would throw at her. She did care about Craig, but she cared more about Soom and she cared nothing for herself. After the dreams she had had for and the nightmares she had had about Soom’s future over the last eighteen years, Lek was not about to leave anything to something as intangible as fate. Her daughter might not be clever enough to pass the examinations, that was something else, but she would sit them, shortage of money notwithstanding. She sat with her mother, but her mother could see that she was troubled, so she cut and peeled some fruit for them both and pretended to be busy until her daughter made the first move. “I never followed you around when you were growing up. Did I do wrong? Why do you think that you have to be at your daughter’s side and not your husband’s? 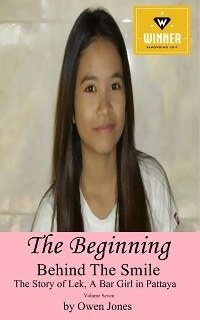 Lek could see her mother’s smiling eyes although no mirth showed around her mouth. “You can only do what you can do. You could not be here for the first part of Soom’s life, but that is not so bad. I did my best and you were here for the last eight years. Soom is a good, level-headed, intelligent girl, now is the time to give her some headroom – let her practice what she has learned – don’t keep her hemmed in. “She may start to think that you think that she’s stupid and you don’t want that do you? Not when she is in a big Bangkok university with all the rich kids. They will give her enough complexes already. She didn’t want to say that she hadn’t consulted him or that she was thinking seriously of going back to work, so she said, “He doesn’t want to live in Bangkok. Nor do I really, since I don’t know anyone there except Chalita and her husband and I couldn’t just hang around with them all the time. Sis has her own life to lead. Maybe I could live in Pattaya, it’s only an hour or so away. “It is a shock to me, I can’t imagine what he is going through. He gave up everything to come here to be with you. All his friends, his family, his connections… and now you are dumping him. Not a very nice prospect, is it? Now that he’s spent most of his money too. It makes you look heartless, my dear, although I know you are only thinking about the security of Soom’s future. “However, you are married now and you and Craig must work as a team. This may sound like your concern alone, but it is not. We might not be able to help you financially, but we would miss you if you left again. It has been so…, so homely, like the good old days, having you around again for the last eight or nine years. “Then there is Soom. Have you asked her about your idea of moving down with her? Perhaps she was looking forward to a lot more freedom. That is one of the perks of going away to study, isn’t it? To learn about life in the ‘real world’, learning to stand on your own two feet? And she’ll have you hanging around criticising her every mistake. “If you want the advice of an old woman, I would say not to abandon the people who love you the most. Look for ways that we, or you and Craig can sort this problem out together. Talk to him properly, don’t just tell him ‘this is how it is going to be…’. He has his pride too and if you push him into a corner, he may leave you and I think that you would regret that sooner or later. Probably sooner too. Craig was well into his fourth pint when Lek appeared at his side. He actually smelled her coming before he saw her, or at least he had caught a whiff of his favourite Thai meal being cooked somewhere near by. “Hello, telak. I have brought you something to eat. You not eat all day and drinking with no food is no good.” As soon as she had mentioned drinking and an implied criticism, she regretted it. Lek was unwrapping her parcel of food and two dishes that already had servings of white, fluffy rice in them. She passed the bowl of curry, a bowl of rice and a spoon to Craig, so that he could serve himself first in the traditional way. Craig knew that he was being buttered up, but he also knew that it was Lek’s way of apologising. It was very rare for her, or any Thai for that matter, to actually say the word ‘sorry’ and she had said it at least six times today already – she preferred to show it in deeds. “I know how important Soom’s education is to you. I know how much you blame your own previous circumstances on your own lack of a formal education and I know that you don’t want the same for Soom. An education with papers – qualifications – is like a guarantee. I know you think all that and I agree with you. Lek felt a lot happier now that the foreseeable problem had been sorted out. She had a year to find next year’s payment and she still had fifty thousand in the bank. Craig could see that the storm had passed but the sky was definitely still very overcast. ∞You can buy Maya – Illusion from the bookshop in the title bar.